The Team of Life is a narrative methodology which uses sporting metaphors to encourage young people to recognise the skills, strengths and resilience of their life teams. It is a playful approach which engages young people through the language of sport rather than the language of problems; enabling them to reflect upon previous accomplishments and recognise how they overcame obstacles with the help of those around them. This document is intended as a ‘how-to’ guide for using elements of Team of Life Collective Narrative Practice to enable vulnerable children, young people and their families to richly describe shared goals and achievements. 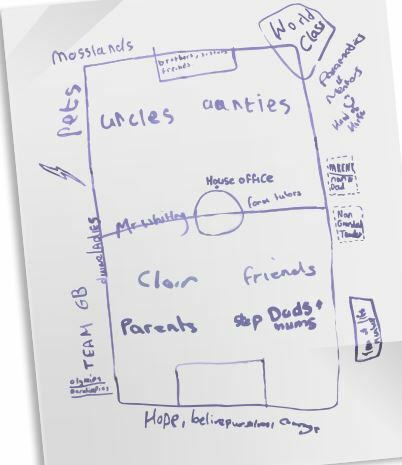 Team-sheets and Goal Maps use sporting metaphors within therapeutic conversations, providing a scaffold for practitioners to chronicle the skills, knowledge and unique outcomes that might otherwise go unnoticed in the everyday lives of children and their families. This resource was written by Dr Vicky Eames, Joint Director/Consultant Clinical Psychologist at Riverbank Psychology and David Denborough PhD, a community worker, teacher and writer/editor for Dulwich Centre.